Eric Dobson and Nancy Salts of Amgen oblige with ready answers, and continue the conversation about how it works in fighting germs. The general topic of their table is antibodies — their structure, function, and use as therapeutics. Older children may discuss the variable regions that fit the pathogenic antigens on model pathogens. Amgen is a leading human therapeutics company in the biotechnology industry. For more than 25 years, the company has tapped the power of scientific discovery and innovation to advance the practice of medicine. Crystal Rawlings of Benaroya Research Institute (BRI) asks the question so cheerfully that it sounds like fun: “Do you want to take a test? !” she says to someone passing by. “Sure,” comes a slightly skeptical reply. Rawlings follows up, “What do you know about diabetes?” and a few questions later, she has her captivated student paging through an activity book. “Can you circle the pancreas?” she asks, and he got it right! BRI’s topic is autoimmune diseases, and they are here to share especially how T-cells regulate the immune system. To ensure all ages understand that T-cells are heroic, they invited a special guest — Tommy T-Cell, the autoimmune disease fighting superhero! 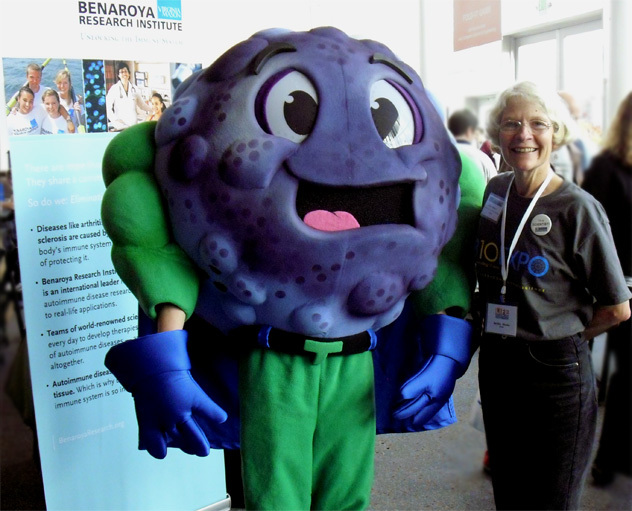 Benaroya Research Institute at Virginia Mason is an international leader in immune system and autoimmune disease research translating discoveries to real life applications. BRI is one of the few research institutes in the world dedicated to finding causes and cures to eliminate autoimmune diseases including Type 1 diabetes, arthritis, lupus, multiple sclerosis, scleroderma and many others. Community support is essential to continue this crucial work of unlocking the immune system and conquering Type 1 diabetes and other autoimmune diseases. Be a partner in unlocking the mysteries of the immune system. How do scientists use simple creatures to understand people? The many answers to that question can be appreciated by people of all ages, who are invited by the Institute for Systems Biology (ISB) to watch cells divide, to see their DNA, and to try cool tools used by real scientists. “Have you extracted DNA before?” asks a volunteer, drawing people into the conversation and in fact, you can extract DNA right at the ISB table. With ISB’s multimedia — videos and slideshows on multiple laptops — cell division is beautiful and fascinating. Adults especially have a lot to click through and investigate in this area and several researchers stand ready to answer questions. The Institute for Systems Biology was co-founded in 2000 by Alan Aderem, Ruedi Aebersold, and Leroy Hood. In just 10 years it has grown to more than 300 staff members, including 13 faculty members and their laboratory groups. This pioneering approach to the study of biological systems takes place in the institute’s 65,000-square-foot facility in Seattle. 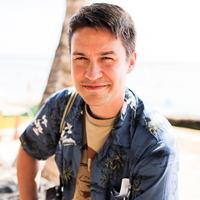 Jeff Bowman is a Science Communication Fellow with Pacific Science Center, and as you might imagine he has some incredible science to share! From the University of Washington in Seattle, to Alaska, to the North Pole! Jeff has traveled far while studying sea ice and microbial respiration — that is, the breathing of very small, very simple forms of life. He is interested in the survival mechanisms of bacteria in cold, salty environments. For Jeff, biological oceanography goes hand in hand with astrobiology. Scientists consider the icy moon of Europa, orbiting Jupiter, as perhaps the most likely host of extraterrestrial life in our solar system, and Mars may have similarly habitable environments. Scientists like Jeff study the origin, evolution, distribution, and future of life here on Earth, and beyond. Jeff brings all this down to Earth, here at Life Sciences Research Weekend with a probe which measures the amount of carbon dioxide currently in the room. As the number of people grows, we can see data from the probe displayed live on one of Jeff’s laptops. The carbon dioxide grows in the room thanks to all of us breathing, up until the room’s ventilation system compensates — then the amount of carbon dioxide levels out on the graph, right before our eyes. Jeff also brought several tubes full of water, mud, and tiny living things from the nearby Duwamish River. He shares with us how they, too are breathing and the differences between their respiration and our own. The Astrobiology Program investigates the wide range of multidisciplinary factors that may influence the origin and evolution of life on Earth and beyond. This investigation demands an intense interdisciplinarity, and the Astrobiology Program at the University of Washington is creating a new community of scholars, investigators, and educators. This community is skilled in multidisciplinary methods and thinking and pushes the boundaries beyond the commonplace with intellectual vigor, creativity, and rigorous method. Astrobiology at the University of Washington builds on the strengths of traditional academic structure to transcend the limits of specialization through the synergy of multidisciplinary cooperation in both research and education. Science Communication Fellows are scientists, researchers and other science-based professionals who have been certified by Pacific Science Center as current science ambassadors and excellent communicators. Fellows join Pacific Science Center in inspiring lifelong interest in science, math and technology. Cecile Krejsa, Melissa Rosscup, and Sarah Powell of Swedish Medical Center offer activities “from pipette to purpose,” leading their young guests through the steps of the scientific method with several colorful and unusual activities. The kids enjoy using pipettes and test tubes to mix colored water. Before they do, one of the scientists says “Let’s make a hypothesis — that means you try to predict what will happen. What color do you think you will get?” from mixing, for example, yellow and blue water. After mixing them together, the kids are asked to compare the result to the hypothesis. There are coloring books available, with pictures of hearts per the cardiology themed table — but those are being ignored, with more exciting things to do — like touching a real pig’s heart! It’s clear that kids enjoy using real lab equipment, even in the most basic experiments, and they love meeting real scientists. Established in 1910, Swedish Medical Center has grown over the last 100 years to become the largest, most comprehensive non-profit health provider in the Greater Seattle area with 8,500 employees, 3,000-physicians and 1,200-volunteers. It is comprised of four hospital campuses – First Hill, Cherry Hill, Ballard and Edmonds – a freestanding emergency department and ambulatory care center in Issaquah, Swedish Visiting Nurse Services, and the Swedish Physician Division – a network of more than 40 primary-care and specialty clinics located throughout the Puget Sound area. In addition to general medical and surgical care, Swedish is known as a regional referral center, providing specialized treatment in areas such as cardiovascular care, cancer care, neuroscience, orthopedics, high-risk obstetrics, pediatric specialties, organ transplantation and clinical research. The “Blood and Guts” demonstration from Pacific Science Center’s Science on Wheels challenges students to uncover the amazing aspects of their insides! With a fleet of seven different vans and myriad possible programs, from a 30 minute demonstration to a full day of exhibits, Science on Wheels takes its a mini science center to locations all over the state of Washington. Exhibits are hands-on, with inquiry based puzzles, experiments, and activities. In “Blood and Guts,” we explore arteries, muscles, nerves, organs — everything that keeps us alive and kicking. 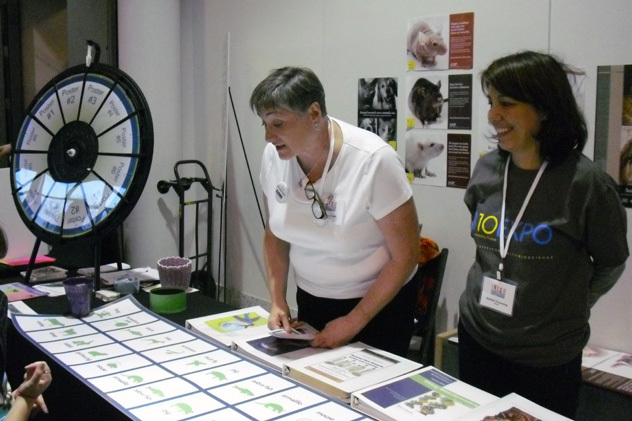 Pacific Science Center’s Science On Wheels program is proud to enhance science and math learning in schools and community events across Washington state. From a 40-minute science show to a full day experience, Pacific Science Center can tailor programs to excite your kids and pique their interest in the fascinating world of science! From school days to evening events to weekend venues, see what Pacific Science Center has to offer to schools, preschools, PTA evenings, science fairs, scout groups, camps, libraries, afterschool programs, fairs and more! Postdoctoral researcher Firas Khatib and Baker Lab mate James Moody float from computer to computer, recruiting everyone who will listen to join the quest to cure cancer and many other infamous diseases — by playing video games! Researchers Firas Khatib and James Moody demonstrate Fold.it. Predicting the structures of disease related proteins is both one of the most promising and the most daunting problems in biology. Uses for designed proteins include fighting HIV, malaria, cancer, and Alzheimer’s. Incredibly and wonderfully, there is something we can all do to help. Fold.it is the relatively new part of the answer, and its origins are an intriguing story in the saga of humans v. machines, brains v. computers. The Rosetta@home screensaver project began just over five years ago, in 2005. You can still download and run the program on your own computer, contributing your extra computing resources to a project which has now been helped by almost 1 million volunteered computers. Many obsess over their statistics, whether contributing on their own or competing in teams. I, NWABR blog author Brian Glanz contribute via the International High IQ Society BOINC platform team, which last I looked was in about 820th place in the world, just ahead of University College London and we had recently pulled ahead of my old team, slashdot. I had originally joined SETI@home, precursor to BOINC on which Rosetta@home et al. now run, in 1999 and my team in 2002. Once upon a time, Khatib describes, people running the Rosetta@home screen saver noticed that the program was making mistakes. They wanted to interact, to correct the computer — and got in touch with project leaders in David Baker‘s lab in the University of Washington Department of Biochemistry. Fold.it was the result — an interactive Rosetta-based program developed by the Baker Lab and the University of Washington’s Computer Science and Engineering. “I didn’t even know that!” mused Jeff Flatten of UW CSE, who was helping people try Fold.it as Firas Khatib told the story of its origins. People have 3D problem solving skills which are, in many cases superior to those of computers. People can guide the computers, and with the game they can manipulate models of protein structures to speed up the processing over all. Firas Khatib enthusiastically responded “Of course!” and handed Tessandore a print-out with the URL — Fold.it. You, too can contribute to science by playing Fold.it on your computer. It is free to download and fun to play. Fold.it competitions are especially popular in schools! The above photo, Fold.it, and this story are also featured in biology text books published by Scholastic Inc.
Modern biochemical research is based on the premise that life can ultimately be explained as a coordinated series of chemical reactions. The field grew steadily through the first half of the 20th century, then explosively after the discovery of the genetic material that is DNA. Today, biochemistry includes the structure and function of the protein, RNA, and membrane components that carry out life processes (structural biology and biophysics). It also includes regulation of the genes that encode these components (molecular and systems biology), functional integration of these components within cells and tissues (cell and developmental biology), and coordination of the myriad components responsible for complex behaviors in unicellular and multicellular organisms (neurobiology, immunology, physiology, and microbiology). Just as importantly, progress in basic science has inevitably led to progress in understanding the causes, diagnosis, and treatment of human diseases as diverse as cancer, obesity, muscular dystrophy, and malaria. The Department of Biochemistry at the University of Washington has contributed to many phases of this research. University of Washington Computer Science & Engineering includes roughly fifty faculty members, fifty staff members, three hundred graduate majors (165 in the Doctoral program and 135 in the Professional Masters Program), and five hundred undergraduate majors (160 graduates per year) in Computer Science and Computer Engineering programs. Ranked among the top ten programs in the nation, we are active in most of the principal areas of the field, and are engaged in a broad range of interdisciplinary initiatives. We are located in the spectacular Paul G. Allen Center for Computer Science & Engineering at the center of the UW campus in Seattle, Washington – a national and international technology center in software, biotech, the health sciences, and other fields. “Want to make your own DNA?” ask Oliver Serang and Leslie Emery, almost in unison. Both representing Genome Sciences at the University of Washington, they are eager to explain the mutant fruit flies, worms, and plants they and other researchers study. “We make them!” he responds enthusiastically, continuing to introduce the basics of genetics and what they do in Genome Sciences. Whether an organism is easy enough to grow is an important factor in what they decide to study, Oliver explains. The genetics of model organisms is a key which unlocks many doors to solving human diseases. The UW Department of Genome Sciences began in September 2001 by the fusion of the Departments of Genetics and Molecular Biotechnology. Our goal is to address leading edge questions in biology and medicine by developing and applying genetic, genomic and computational approaches that take advantage of genomic information now available for humans, model organisms and a host of other species. Our faculty study a broad range of topics, including the genetics of E. coli, yeast, C. elegans, Drosophila, and mouse; human and medical genetics; mathematical, statistical and computer methods for analyzing genomes, and theoretical and evolutionary genetics; and genome-wide studies by such approaches as sequencing, transcriptional and translational analysis, polymorphism detection and identification of protein interactions. Not sure what Genome Sciences is all about? Follow these links for a basic overview of our research and streaming video of the 2009 Public Lecture Series. Please follow this link to support our research. These high tech, anatomically correct mannequins can mimic many diseases and normal body functions. Renton Technical College (RTC) is one of 34 colleges in the State of Washington operated by the State Board for Community and Technical Colleges. RTC provides training, retraining and upgrading for persons seeking marketable job skills or upgrading current skills. Training at Renton Technical College is relevant. The worker of tomorrow is trained by the journey-level instructor of today. Trainees are ensured that only those skills and concepts essential for seeking, gaining and holding a job are taught. At the same time, they are guaranteed they will not be taught superfluous skills and concepts. Mathematical, scientific, communication and human relation skills are integrated into practical instruction. Heads turn, looking for the box, until they realize Jiwan means the small, clear box in his hands. “Really?” is a typical response. Jiwan launches into explanations of photosynthesis, how plants grow and what they need, and next micropropagation. Down the hall in the Harry Potter exhibit, this would pass for magic. Jiwan is in the Genomics Lab of Horticulture and Landscape Architecture at Washington State University, and he’s joined here today by Chris Hendrickson and Scott Schaeffer also from WSU. Together, they take us on a tour of fruit and medicinal plant genetics. Tissue cultures and stem cells are discussed, and on that note we see tobacco being used for study. Why? because “it grows like a weed” Hendrickson says. Schaeffer teaches us about genes introduced to the local apples we all love eating, to help fight diseases typical for apples in the Pacific Northwest. Magical and practical and delicious — the science of the fruit of the future! The Department of Horticulture and Landscape Architecture is in the College of Agricultural, Human, and Natural Resource Sciences. Undergraduate degrees are offered in Landscape Architecture, Integrated Plant Sciences, and Agricultural and Food Systems. Graduate degrees are offered in both Horticulture and Landscape Architecture. The WSU Horticulture program was recently ranked number 8 in the nation, with the Plant Sciences program ranked number 2 by a survey in The Chronicle of Higher Education. Read more. Israel Reyes is offering a look at something he calls “magic sand.” Its ability to stay dry is just one of many things which change when you go from “macro scale” — the size things are in our daily lives — to “nano scale.” One such change is to the nature of surface tension, another change is to color. The SHINE Technology program at North Seattle Community College brought several interactive items to demonstrate and which help share their knowledge, from that magic sand to a liquid crystal sheet which can display your hand print. It is a table with many connections to medical research and devices — you can even ask them about buckyballs. The Seattle Hub for Industry-driven Nanotechnology Education (SHINE) was established by a 3-year, $861,646 National Science Foundation Advanced Technological Education project grant to the Nanotechnology program at North Seattle Community College. SHINE acts as a regional hub to promote awareness of the principles of nanoscience among the public, middle and high school students, and STEM educators, while expanding the diversity and number of trained nanotechnicians entering the local workforce and/or transferring to pursue Nanotechnology education at four-year institutions. For many, improving heart health should start with reading labels — nutrition information and ingredients for the foods we eat. That’s the lesson Laurie Sween and Suzanne Vogt of The Hope Heart Institute wanted to make sure we took home from their activity table. To help us get the message, they brought their “lard lesson,” which helped visualize the fat in food and its effect on our bodies, our blood vessels especially. Cheerfully but seriously, we were invited to participate in an activity with turkey basters — one with fat in it, the other not. By pumping these, we could get a feel for how much harder it is for our hearts to pump blood if we’ve eaten unhealthy, fatty foods. The Hope Heart Institute has a 50-year history of revolutionary medical advances and educational curricula that make heart disease – America’s No. 1 cause of death – more treatable, beatable, and preventable. The mission of the Hope Heart Institute is serving humanity through cardiovascular research and education. For more, visit http://www.hopeheart.org/.